This scene was originally used for the Marine Society bowls produced at Worcester. One figure now says (in a bubble) "We will go to Mr Clark's" to make it suitable for electioneering on behalf of Godfrey Bagnall-Clarke in the 1768 Derby election. 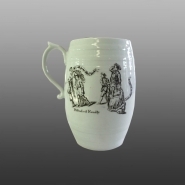 This mug is printed in black over the glaze with a scene entitled "English Hospitality/ Sutton Hall". This print bears a printed mark of an anchor and the name "Derby". The reverse has a scene entitled "Distressed Family". Both of these prints were originally used at Worcester but without the titles, which were added to make them suitable for use in the 1768 parliamentary election when Godfrey Bagnall-Clarke of Sutton Hall stood for the County of Derby. The "Sutton Hall" print is also known badly printed in blue on a Derby porcelain dish.. This mug and dish represent the efforts of Richard Holdship to make use of printed decoration at Derby, after he had left Worcester in 1759.